The Nightingale Luscinia megarhynchos is one of the most treasured of Britain's birds, famous for the rich tone, exceptional musicality and high volume of its territorial song, as captured by the Nightingale celebration CD. Within Britain, its distribution has always been restricted to the southeast. Atlas data since the 1960s, however, have shown a clear contraction of breeding range away from its western and northern limits. Census data also show that numbers have declined strongly in recent decades. BBS indicates that, between 1995 and 2009, the British Nightingale population decreased by 57%. One possible explanation for the decline is that habitat suitable for Nightingales to breed in is becoming scarcer. Nightingales are long-distance migrants, wintering in West Africa, and BTO is also investigating the problems they may be experiencing there and on migration, following a study in 2009, which investigated the movements of tagged Nightingales. In spring 2012 (with top-up coverage in 2013), BTO volunteers conducted a full survey of breeding Nightingales across Britain, supported by the Nightingale Appeal. The main aim of the survey is to map all singing males and compare their numbers and distribution with the previous 1999 Nightingale Survey. Knowing where Nightingales are in 2012, and which habitats they are using, will greatly aid their conservation in future years. For example, there may be opportunities to create woodland habitats, suitable for nesting, in areas where the availability of habitat appears to be limiting population growth, or to give greater protection to Nightingales in key areas. A completely new element of the 2012 survey is investigating how many males are singing at night later in the spring. New research (Amrhein et al.) suggests that only unpaired males continue to sing during the darkest hours of the night, whereas all territorial males sing in the daytime (especially at dawn and dusk). We hope to discover whether the proportion of night singers varies systematically, for example with Nightingale density, with habitat, or with distance from the edge of the range. Again, any new information will help to focus conservation efforts for this exceptionally charismatic species. Amrhein, V., Korner, P. & Naguib, M. (2002) Nocturnal and diurnal singing activity in the nightingale: correlations with mating status and breeding cycle. Animal Behaviour 64: 939–944. Amrhein, V., Kunc, H.P. 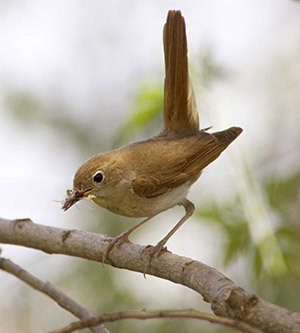 & Naguib, M. (2004) Seasonal patterns of singing activity vary with time of day in the nightingale (Luscinia megarhynchos). Auk 121: 110–117. Amrhein, V., Kunc, H.P., Schmidt, R. & Naguib, M. (2007) Temporal patterns of territory settlement and detectability in mated and unmated Nightingales Luscinia megarhynchos. Ibis 149: 237–244.